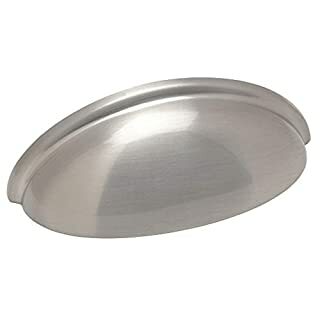 Looking for knob or handles for your kitchen or bathroom cabinets? Yes, you are in the right place! We know it can become quite an ordeal sometimes. There are literally thousands of items ranging in different colors, styles, and material out there. The risk factor is not only choosing from this vast range but from many of the high-end brands that may or may not offer good quality items for your cabinets. It’s interesting how some styles can renew a cabinet while others can make it look even blander. 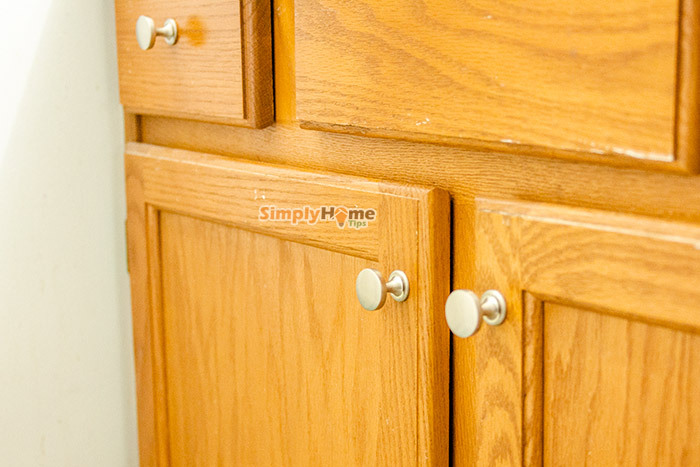 For people looking to renew their kitchen cabinets, or making cabinets at home, we’ve chosen some of the best cabinet hardware that covers knobs, handles and pulls. These are all-rounder safe to use designs that look great on the majority of the bathroom and kitchen cabinets. Unlike some of the major hardware brands out there, Cosmas is a pocket-friendly brand that we rely on. 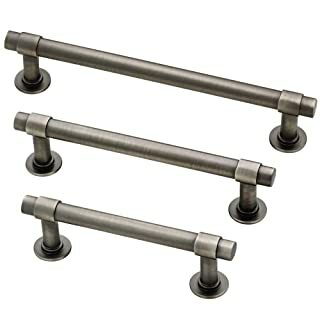 They do not charge unnecessarily and have some of the best variety on the modern cabinet hardware. 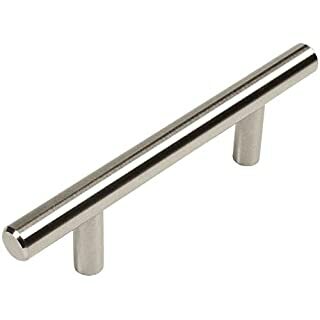 This handle pull is sturdy and well built. It weighs a bit, and that can be felt when held. The cost is great and easily accessible for the majority of the people. The quality does not decrease in any way for what it is worth. It has a gleaming satin finish, and the construction material is metal. This item is available in nickel silver color only, which may appear as a limiting option to some. But we believe it’s a good generally usable color since it mixes and matches with whatever the color and material of the cabinet or drawers. Amerock offers a wide variety of state of the art home and office hardware accessories and products. The products are beautiful and of high quality. One thing Amerock deserves due credit for is the sophisticated and minimal design of this product. It’s as simple as they come. 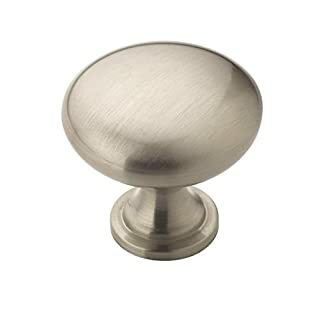 It is round door knob with a variety of color and finishes to choose from. More variety means more styling options to choose from. The quality and longevity of the item are great. Once invested in, we expect maximum time durability. The materials used are solid zinc to ensure minimal rusting and fade during use. With the screws provided and the installation designs, these can be installed in three easy steps. This is a good option for people who like doing things on their own. 1″ and 1 3/4″ customizable length break away mounting screws. The company offers a 100% warranty. In case of damage or malfunction, the company claims a full replacement. For the price, this is a bonus feature. 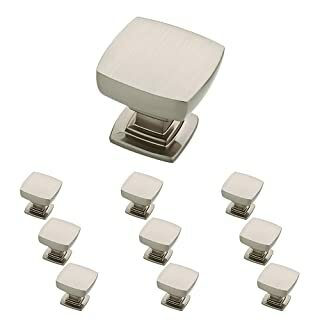 These are lightweight knobs that are easy to install. These are not sturdy but weigh enough to let you feel that they’re made from a reliable material. They also have a high reflective shine that isn’t normally common with Satin Nickel finish. The company provides two different sizes of screws for the consumer to use according to the requirement. For those that prefer a stronghold when opening and closing a drawer or a cabinet, this is a decent option. It’s solid, sturdy hardware offered at a great price. These minimal yet contemporary modern designed handlebars are an excellent match for any kind of cabinet, whether in the kitchen or the bathroom. These offer both style and functionality. These look great as hardware for oak colored surfaces as we’ve observed how dark surfaces appear to make these gleam more. These are made from cold rolled steel bars and index taped for maximum strength and functionality. They’re furthermore plated with pure nickel to prevent rusting or corrosion. 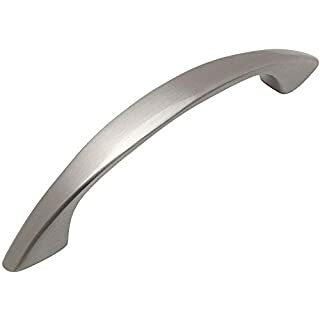 Then brushed nickel finish gives an elegant semi-matte shine. These come in multiple sizes to cater to different consumer demands. The various colors to choose from also makes it easy to buy the item. The most favorable option for consumers is the time-saving aspect when looking for different themes to invest in. 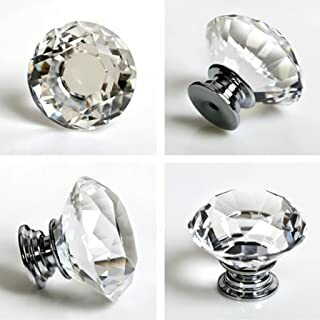 These crystals doorknobs have been all the rage by designer hardware stores. They’re great for bringing in that bling factor. Wherever they’re installed, they give a posh look. Who wouldn’t mind that for what these are worth? These are great to lighten up any room. The highly reflecting crystal makes it a fashionable addition to any cabinet or drawer hardware whether at home or office. 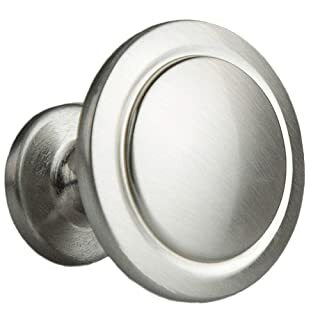 The knobs might be fancy, but they are durable and do not in any way give out on their actual purpose. These are made from real glass and zinc alloy. They last a long time. The only problem that can arise is the adhesive giving away and the crystal falling off. It comes with three different sizes of screws. This caters to the installation surface needs and makes the process relatively hassle-free. Like we mentioned earlier, Cosmas offers different hardware options at a price that we can’t resist. For people who don’t like knobs and the amount of work that goes into cleaning them, this is the next best thing. These are highly reflecting solid cup-shaped pulls. The color or style variety is near to nil. But the shape and color of this are suitable for the majority of the color and cabinet materials which makes it usable for almost all types of surfaces. These are meant for vigorous everyday use. These are great in shape and design. The ergonomic design makes them easy to grip. Installation is easy. A single size of screws is provided. 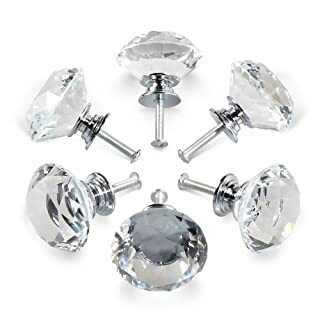 Another diamond shaped knob? Why? Because we can’t get enough of them. These differ from the ones we mentioned above in quality and size. While the ones we mentioned above boast off an uncommonly large size, these are of a standard and relatively small size. This is important to some because some customers prefer a little less sparkly and crystal look to their drawers and cabinets. These are also available in four colors. The quality is not that great. But for what they’re worth, they’re a steal. They are highly reflective and look great. But on closer inspection one can easily see the glue that holds the crystal to the base. Some even have the plastic remnants from the mold they’re made in. While the installation is just as easy as any, we felt that the screws provided are a little too big for these so a size smaller might be more preferable. Franklin Brass is a company known for coming up with exceptional bathroom cabinet hardware, from shower and tap faucets to cabinets and what not. The knobs, of course, can be installed in the kitchen and anywhere else. These come in rounded square shape. They have a dull to a semi-gloss finish and are available in four colors. The satin nickel finish perfectly goes along with the usual metallic appliances and theme of the bathroom cabinets or kitchen cabinets. These weigh enough and have a solid built. They’re well built and scream quality. They’re heavy duty, made for every day pulling and pushing and feel substantial when using. Installation is slightly complicated. It might not be as easy as a do-it-yourself thing. The package does include installation hardware however it is advised to invest in the Alignright Template that is sold separately for an easy installation. These arched handles may seem a bit old school or appear not as versatile as the others mentioned in this review, but they’re just as useful and effective as any other. They’re still a great option for those kitchen cabinets that might need a yank to open and the handle coming off is the last thing anyone would want. They’re made from durable metal with a satin finish. Once installed, they’re expected to last quite a long time. The arched design makes them very practical for use. Its an all-rounder kind of style suitable for all cabinet and drawer types. It fits snuggly against any types of surfaces and looks great against any color, especially the darker ones. When buying a pack, many have complained that one or two pieces come out faulty with very unaligned holes. The screws provided are fine and make installation a breeze. 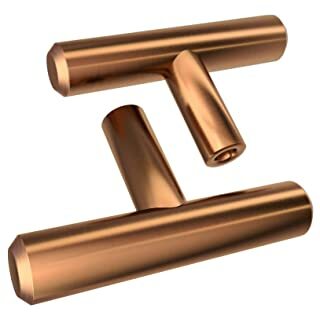 What we like about the cabinet hardware offered by Franklin Brass are the premium quality products with an economical approach. They also offer matching accessories that can go along the way when it comes to redesigning or setting up different parts of the house. The entire look of this straight bar pull is great. It is contemporarily styled yet bold and simple. The gunmetal finish or any of the other colors it comes in, all of them have a dark metallic undertone which makes them look sophisticated all at once. The bar pull weighs a little and feels great to hold. It has a solid, sturdy build. These are great to put against large cabinets or used as a chest of drawer hardware. The company offers a limited lifetime warranty on these. This is one of the most accurate and easy to install hardware on this review because the accuracy of the screws included by the company. The installation hardware is included in the packages. When renovating your home, it can be harder focusing on the minute details of having to choose between knobs, pulls or handles. When in fact these do not hold any significant advantage over each other. It’s more about what one feels comfortable using hundreds of time daily. These give doors, drawers, and cabinets a sophisticated look and we love them for that. But these need solid installments since out of the three, these tend to give the more troublesome time of coming loose. These also might not provide that solid hold feel that a pull or handles do. These feel great to hold. They have more area for attachment to a surface. They’re reliable and great for drawers. These also last for a longer time. Can be used vigorously and offer more than just one way to open it. Ever open a drawer with your toe when your hands were full? Can you do that with a knob? See what we mean? Why do all the heaviest of doors, drawers, and cabinets seldom have handlebars attached to them? They offer a greater surface area and lesser force exertion to open them. The grip is strongest with these and most satisfactory. But the grip depends heavily on a well-aligned installment. How do I choose between styles, colors, and shapes? The easiest way to determine that is to follow some steps. Research what would look good in your home according to your taste. There are thousands of styles and shapes to choose from. Determine what appeals to your sense of style. 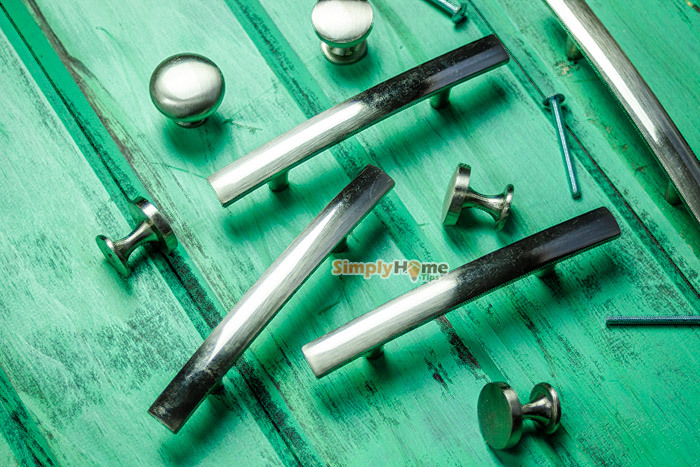 Select a few ideas to relate to when shopping for knobs, handles or pulls to know exactly what you want. One can be flexible of course. Be sure of the color. If not, one can visit a hardware store and acquire a sample to put against the surface it will go against for a better idea. Understand that the majority of the colors shown on the internet vary slightly in real because of photography, lighting, and editing, etc.